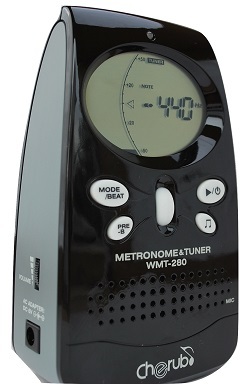 WMT-280 is a combination Metronome, Tuner, & Tone Generator. It is the essence of Tempo and Tone. Enhance your rhythm chops and tempo. Calibrate your ears to various A4 settings with the Tone Generator. The rolling wheel makes the operation simpler and faster than your usual metronome. Its green, too!! The WMT-280 will automatically turn off if not used for 5 minutes. The settings are saved at power-off. Includes Power Supply to save battery life. Classic look with digital features- loud click or voice. Tempo range 40 - 208 bpm. Voice will count "one, two, three, one, two, three etc" if set to 3/4 and set on 1/4 note subdivisions or "one and, two and, three and etc". You can also set the metronome to count with a voice to say "three, two, one" as a pre-beat to count off the beat before you start. The red LED at top of metronome indicates the downbeat which turns green to indicate the on/off beats. Volume control - for voice or woodblock tone. Tone Generator- C4 to B4 range adjustable from 420 to 460 hz. The tuner will tune your instrument using an external microphone or plug directly into the 1/4" jack. Range of tuning is A0 to C8. Uses 4 AAA batteries (included) or there is an input jack for an external 6 volt power supply - included. Dimensions: 80(W)x50(D)x135(H)mm. Weight: 150g- Color is Black. Cherub metronomes and tuners have the most advanced features for the least amount of money... The display on the Cherub Wsm001 metronome is larger than most other metronomes. 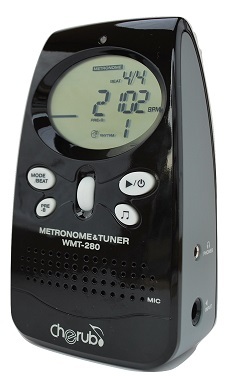 The Wmt220 is a talking metronome that will do a pre count down .. such as 4 3 2 1 as many times as you program the metronome. The visual features are also excellent, using many led lights to tell you where you are in the beat. The memory functions an available rhythms on this metronome sets this metronome apart from all other models. This metronome has a classic look with digital features. The Dr Beat metronomes are the most advanced models, having features not found in other metronome models.. These models are excellent teaching tools for learning simple or complex rhythms. All Dr Beat models are digital metronomes. The DB 90 is a talking metronome.. it will count out loud with a voice. The DB90 will also count very complex rhythms, with all parts of the beat being controllable. The DB60 has most of the same features as the DB 88, with out the voice and a few other features. All Dr. Beat metronomes come with a manual with full instructions. Need a loud metronome... the loudest are the , Matrix Mr600, and Seiko Sq70- are our loudest. Need a very loud metronome -- for chorus, band, orchestra, large groups... look at the MetroAmp packages.